performers. 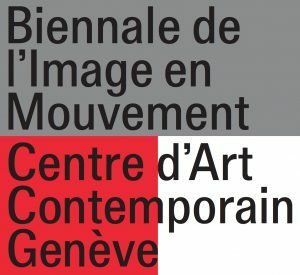 The 2016 edition will be inaugurated in Geneva between 9 and 13 November 2016 and will offer a dense program of openings, meetings, performances, special screenings and conferences. November 2016 marks the 15th edition of the Biennale de l’Image en Mouvement. The year 2014 marked a new event format, which considers its own history while looking to the future with a commitment to a young generation of artists. this format, artists are invited to push the boundaries of traditional media. The originality of the new BIM resides in the fact that it consists exclusively of works commissioned and produced for the occasion, with no specific curatorial theme to respond to. This distinguishes the BIM from the usual biennial format and positions it as a post-curatorial event, leaving the artists a carte blanche to shape their own discourse while questioning the status of the curator. The Biennale de l’Image en Mouvement seeks to investigate new exhibition models and formats by building a show as a choir, bringing together polyphonic voices to offer a window onto contemporaneity. The 27 new projects produced for the BIM do not aim at surveying the moving image in a broad sense, but rather tries to create a dialogue around today’s world from an often feminine point of view. The Biennale will explore how artists depict today’s major themes of life and manage to make their work necessary and remarkable, through their strong engagement and their ability to raise awareness. This edition of the Biennale makes spaces for differing and converging positions among a group of artists. For example Boychild, Wu Tsang, Emilie Jouvet, Pauline Boudry & Renate Lorenz or Phoebe Boswell’s works question the notions of gender, the female figure and empowerment. While others, such as Salomé Lamas, Karimah Ashadu, Bertille Bak, Hicham Berrada and Bodil Furu investigate the exploitation of human and natural resources in various locations around the world. These projects, along with Yuri Ancarani’s documentary on the exuberant leisurely activities of the Qataris and the anthropological researches made by Trisha Baga, Tracey Rose, Cally Spooner and Kerry Tribe, underline the polarities of our world. Additional new works by Sophia Al Maria, John M. Armleder & Stephan Eicher, Brian Bress, Loulou Cherinet, Massimo D’Anolfi & Martina Parenti, Alessio Di Zio, Jenna Hasse, Evangelia Kranioti, Cinthia Marcelle & Tiago Mata Machado, Boris Mitic and Emily Wardill have also been commissioned and produced for the occasion. The BIM 2016 encompasses a variety of artistic practices including video, sound, dance, performance, installation and even clubbing, broadening the scope of the moving image beyond the digital condition under which we often reductively see the world in 2016.